As an SEO, moving a domain name comes with a certain degree of fear. Search engine rankings can drop, site authority can be lost and traffic can plummet if you don’t tie up the move perfectly. 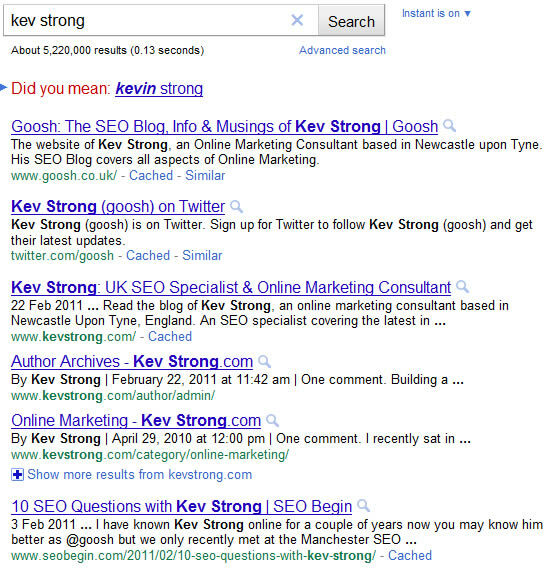 Almost a year after its reincarnation, I decided to move my domain name from www.goosh.co.uk over to www.kevstrong.com. Why? I had finally secured the twitter username I had been chasing for almost two years – @KevStrong (another post is coming on how I achieved this). In doing this I wanted to ensure I retained all of my inbound links, all of my traffic and, ultimately, all of my website authority; I never expected my TBPR (Toolbar PageRank) to update after 2 hours. To ensure the search engines and users alike are redirected, I recommend using a 301 server redirect which sends them to the new URL and, in the case of the search engines, pass all authority to the new destination you have specified. With nearly 60 pages of content all interlinked as part of my onsite optimisation I had to ensure that all links were updated so they passed full authority directly and not through a 301 (where a small amount of authority attrition can occur). This would have been easier to do had I used absolute path interlinking ( href=”/path/” ) as opposed to domain interlinking ( href=”http://” ) but I chose domain interlinking to ensure I receive link backs to my content should it get scraped (as often happens in the SEO niche) and the domain name not replaced. Getting a list of indexed URLs is easy and acts as a priority list for you should you have a large number of indexed content. 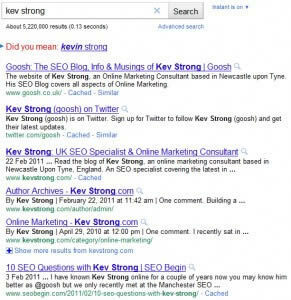 This is achieved using the site: operator in Google. In the case of moving my website to a new domain it was a simple mirror image of my website on the new domain name so I didn’t have much complication. As I am hosted on a Unix Apache server this was achieved with a flat URI remapping in my .htaccess file. E.g. This is essential for making the transition as seamless as possible. 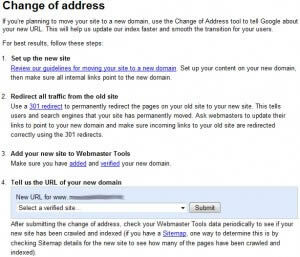 Access Google Webmaster Tools and “claim” both of your domain names if you have not already done so. I highly recommend using the “Upload HTML Verification file” where possible as this not only reduces code bloat on your website, but it also hides your META verification number from prying eyes. Also, Google are kind enough to let you upload one file once your 301 redirect rules are in place. Creating a sitemap.xml file and submitting it to GWT ensures you are letting Google know of all URLs that you have on your site. When used with a brand new domain I have seen new sites indexed in less than 10 minutes using this sitemap submission service. Google allow you to notify them of a change of address (much like moving house) and I can only assume that requesting this change directly via two verified accounts gives Google the upmost authority it can get to move everything to the new domain name. This appears to be the Holy Grail when it came to retaining my TBPR so quickly (remember: 2 hours). Can be manipulated to receive an artificial TBPR update on a new domain (and then off I trot to DP to sell to the people who put a price on such inferior things). Can be reversed just as easily. Interestingly Google seems to have only updated the homepage TBPR and none of the inner pages. I hope this helps throw some insight into moving a domain name with the minimum of downtime to your rankings, authority and traffic and how you can really get the search engines to do the work for you. Hopefully it’s not just a temporary glitch, but you’d have to imagine that it wont stay that way forever. Not sure about reversing the process, I’d reckon that’s one for another post with a couple of domains you really have no interest in using. PS. would you like to buy some gift baskets from China? I’ve had a further thought on how this could have been achieved but I need to look into something first; it may explain why it was so quick. Hi Kev – nice job here. Actionable posts FTW every time. This is certainly the fastest i’ve heard TBPR being recovered after a (well planned) domain move. In a former life, this was a regular exercise for me and my team as we regularly discovered clients had older domains they were using to split test us against a competitor or just to see what we could do in a few months. I can tell you that it is possible to repeat successful results dependably when you have a thorough redirect and internal linking update plan. WMT (at least up to a year ago) seemed to add varying levels of benefit in terms of speed of recovery. Though the exceptions may have been anecdotal. Thanks for the good read, sir! The internal link redirection is a must IMO. It hasn’t let me down yet.